Set consists of 425ml Radiant Organic Apple Cider Vinegar, 500g Radiant Organic Ginger Honey and 370ml Lakewood Organic Pure Lemon. 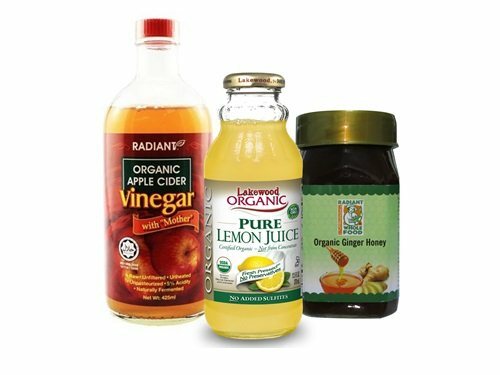 Radiant Organic Apple Cider Vinegar is a product of New Zealand, certified Organic by BioGro New Zealand and Halal Certified by JAKIM. Naturally fermented and contains "Mother of Vinegar" with no added chemicals, preservatives or additives. Radiant Organic Ginger Honey has the citrus aroma of yellow ginger that helps to relief cold, sore throat, nausea and indigestion. Certified organic by Lacon Gmbh. Lakewood Organic Pure Lemon is fresh pressed from fruit and free from artificial sweeteners, colourings and sugar. 100 % Organic USDA Certified from Florida, USA.